While many people agree on that saying “dogs are man’s best friend”, I am going to spend a little time talking about why I think the Havanese should be considered best of the best. There are some many different breeds that are so much fun to live with and play with, so it is more of a personal preference than anything else. Yet, I bet you would agree with at least some of the following reasons why the Havanese are just so good. What is better than having a happy dog welcoming you home every time you get home after a tough work day? There is no question that we all need that cheerful personality in a Havanese to cheer us up. When you see him looking happy, you do usually feel very happy yourself and you will be able to squeeze that extra ounce of energy out of you and play with him. There is a very good and positive loop that can hugely improve the lifestyle of both the dog and the owner. Dogs are like our children. We want to train them not just to entertain ourselves. Instead, we just simply feel happy when we see them learn and improve. Havanese are highly trainable and intelligent dogs. Isn’t it just wonderful to be able to see them grow and learn new tricks. Being small can be a really huge advantage especially in today’s world. Since a lot of people live in small apartments, it is nice to have a dog that doesn’t need a lot of space. Of course, it comes down to personal preference whether to own a small dog or a big one. Yet, generally speaking, owning a small one is more practical. To give you a rough sense of how small they are, they usually weight from 7 to 13 pounds and they are around 10 to 11 inches tall. For those of you who have a lot of different dogs or even a lot of different types of pets at home, having a Havanese in the mix is usually not a problem as they do get along with other pets very well. Even though that is the general case, you should always be very careful at first by observing what actually happens because there are always exceptions and we never want those exceptional cases to harm our pets. I have already touched on this point in a previous idea. The fact that the Havanese is generally small does make it apartment friendly. Generally speaking, the Havanese can very easily adapt to both house living and apartment living. That’s good news for those of us who can’t afford to buy a big house yet still enjoy the fun time playing and living with a Havanese. Having dogs that are friendly with your keys is very important. Don’t underrate this factor even if you don’t have kids yet. Remember, having a dog is a long term commitment. We should have the mindset that we are going to spend a large portion of our lives with our dogs. So if you want a baby sometime in the future, having a Hanvanese rather than having a children-unfriendly dog is preferable. Now, let’s talk about some obvious. It may not sound very politically correct that looking good making something likeable. But let’s get real here. If the dog look cute and you love it, isn’t it natural that you will treat him well and love him more. There’s not saying that you should treat an average-looking dog poorly. I am just saying that, with the beautiful hair, a cute Havanese makes it so easy for us to love him more and treat him well. Although the Havanese is small, it is actually quite tough, in terms of being quite sturdy physically. How is that an advantage? Remember that it has a playful and cheerful character? It is nice that we don’t have to be too concerned with the possibility that the Havanese would get injured easily during the playing process. That’s especially important if you have children in your house. Some young kids are not very good at controlling their strength at a young age while playing around. For the sake of comparison, the Maltese is also a small dog but it is much less sturdy. 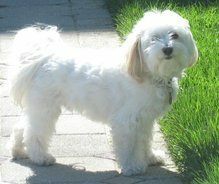 The Havanese is small yet it has the mentality that is tough enough and it is also intelligent enough to be trained as a watchdog. Yet, due to the limitation of its size, it can be be trained as a guard dog. But hey, having a small and smart watchdog isn’t bad at all. Havanese have a pretty high level of energy, especially for small dogs. They do need to have around at least twenty minutes of exercise every day. The good thing about that is that it can force you to do exercise every day. That can be a really way to help you develop some good exercise habits. This is probably not a real advantage but I always love the stories behind dogs. The Havanese is named after Cuba’s capital, Havana. It is believed that some Spanish brought a few Havanese to Cuba long time ago around the 18th century. Having looking at the above great things about the Havanese, are you more and more interested in having a Havanese of your own. Don’t rush or take any move yet and it is always rewarding to have more patience. Talk to more people and see if they are really suitable to your situation such as the quality of your home, the general weather of the city you live in and, most important, your patience. You long term commitment to treat him well for the rest of his lift is something that you have to make sure that yourself can do.